Connect your BookingCenter PMS to AirBnB. Make working with AirBnB easy and automatic. BookingCenter maintains concurrent availability to your Booking Engine, GDS and OTA channels with your AirBnB listing. Build a marketing profile in AirBnB for each Room Type in BookingCenter. This allows you to have separate unit profiles for a variety of accommodation types. When a BookingCenter customer updates availability (either opening or closing), the availability of whichever Room Type(s) are mapped to AirBnB is automatically updated to the AirBnB system. When a ‘booking request’ is made from the AirBnB system, the Host is notified by AirBnB and the normal ‘vetting’ process AirBnB maintains between traveler and host begins. 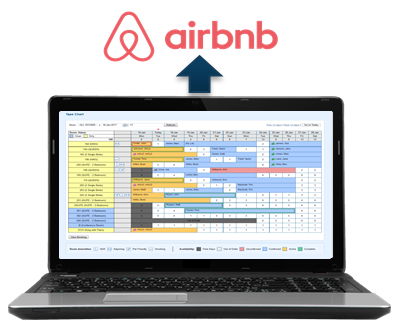 If/when you decide to take the AirBnB booking, you simply enter the AirBnB booking into your BookingCenter product and then availability syncs to all channels: PMS | OTAs | GDS. And, of course, AirBnB. To participate in the AirBnB interface, you will need to provide BookingCenter support staff with an acceptance of the annual interface cost ($360/year) and your AirBnB Account ID, User Name, and Password. Without these, we cannot interface. If these change throughout the year, you must immediately notify support staff with the updated credentials. You will have to manage Rates from within the AirBnB ‘extranet’ (or app) – using either you own manual rates, or using AirBnB’s automated Rate Intelligence tools to set rates based on demand patterns. When booking requests are made in AirBnB, the ‘Host’ will correspond with the ‘traveler’ as per the normal AirBnB process. If the booking is accepted, the booking must be entered into the BookingCenter software in order to get availability synced across all channels of distribution. There is no ‘automated’ way to import the AirBnB booking, though BookingCenter is examining ways to accomplsih the task. Annual Fee: $360 per year, payable at beginning of yearly term and non refundable. This includes setup assistance to your existing AirBnB account and mapping whichever Room Types desired. All AirBnB / BookingCenter customers receive 24 x 7 technical support and updates to the interface.